Emergencies don't sleep... Neither do we! You are probably in the middle of a difficult situation, so why bother to pay for an estimate? We are here to help you and make it easier for you! Restoration and extraction. Timely service for both residential and commercial properties. Get rid of unwanted water, dry your furniture, walls, carpets, etc., and restore your home or office. Equipped with the most advanced technology, we restore your home or office after a devastating fire disaster. Remember: quick action is very important. Removal and inspection. Commonly followed by water damage, mold can be a serious threat for your health such as itchy eyes, nasal blockage, difficulty breathing, cough, headache, sinus problems, etc. Air duct, tile & grout, carpet, upholstery, oriental rugs, leather. Remember, free estimate on any cleaning service. Dissasters can strike anytime, and we are ready to help you anytime. I doesn't matter the day or time. Call us for immediate response. We can't avoid disasters to happen, but we can help you move forward. 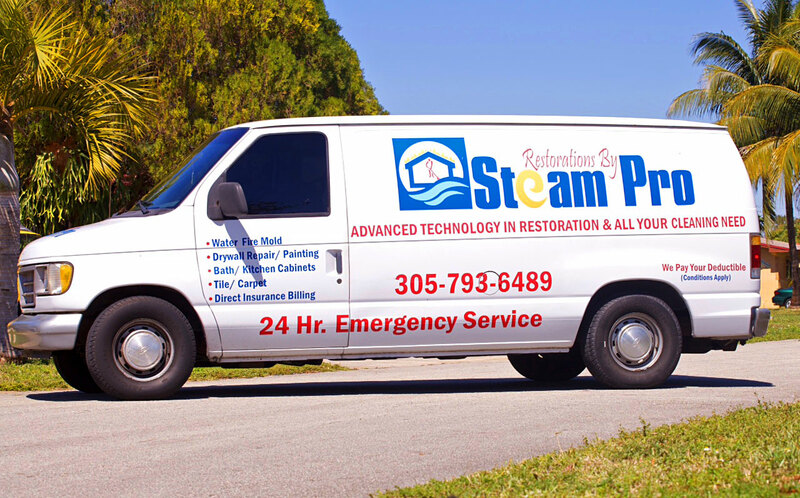 SteamPro is a family-owned business, serving all south Florida for over 22 years. Our goal remains the same as when we started back in 1991: "Provide you with the best cleaning and restoration services, with fair and reasonable prices, using the most advanced technology, acting ethically and professionally with a permanent sense of urgency". An emergency or catastrophe can strike anytime, therefore, we encourage you to take all the necessary measures to keep you safe. As we said above: "Emergencies don't sleep... neither do we!" Personalized service on every project. Immediate response. FREE ESTIMATE ON ANY CLEANING SERVICE!